In this intimate, revealing work, Andy Summers writes fluidly about his first guitar, his experiences with earlier bands, his relationships and encounters with Eric Clapton, Jimi Hendrix, John Belushi, and The Police, and more. Less-known is Andy’s early musical career in the U.K., where he achieved moderate fame. But after Andy ended up in California, ultimately finding himself out of work and teaching lessons, he returned to England, where serendipitous circumstances found him on a train with Stewart Copeland. The rest was history. This is the moving, gently (and often acidly) funny memoir of a premier guitarist who ultimately found himself at the top of the world. 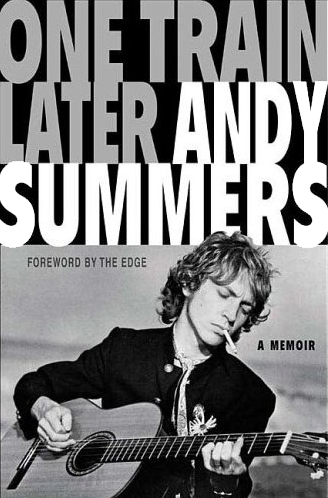 The pick of the litter here is without a doubt One Train Later, a memoir by Police guitarist Andy Summers (St. Martin’s Press, $24.95). The title refers to the chance meeting Summers had with drummer Stewart Copeland: If either had caught a different train one afternoon in the mid-’70s, one of the most successful bands in rock history might never have come together. The attitude Summers displays in that title — bemused, non-nostalgic and distanced enough to be both very funny and brutally honest — prevails throughout the book, which is evenly divided between his early days on the fringes of the British progressive rock movement and the surprising rise of the Police concurrent with (but never really a part of) the punk explosion. The book ends with the demise of that beloved trio, leaving more than two decades of solo work unaccounted for. But that’s fine, given that most of us want to read about the famously fractious battles between bottle blonds Summers, Copeland and Sting, and the writer/musician doesn’t disappoint. “This time the studio feels more like a canvas for dirty fighting,” Summers writes of recording “Ghost in the Machine” (1981). “The stakes have been raised, and instead of rejoicing in the unbelievable success we have created together, we lose sight of the big picture and go on in emotional disorder, each one of us battling for his own territory. … There is a humiliating episode in the studio one day when as a result of all this tension and loss of perspective, Sting goes berserk on me, calling me every name under the sun with considerable vehemence, leaving everyone in the room white-faced and in shock.” Ah, yes, we always knew Sting was an egotistical jerk! But Summers doesn’t shy away from his own rock-star foibles, and the combination of this unflinching frankness and the author’s considerable insights into the making of the group’s best music combine for illuminating reading, leaving fans appreciating the group’s accomplishments all the more, and marveling that it ever managed to create anything at all. Engaging memoir by the guitarist for megaselling rock band The Police. Summers’ account of his eventful career as a journeyman musician focuses squarely on his devotion to music and the process of mastering his instrument; those hoping for a lurid, behind-the-scenes tell-all will be disappointed. For the record, he paints Police front man Sting as self-involved and high-handed, drummer Stewart Copeland as motor-mouthed and overbearing ‚ but he doesn’t dwell on these traits. Nor does he dwell on drugs consumed and groupies enjoyed, describing such diversions as mundane aspects of the itinerant musician’s life. More interesting is his life as a perennial cusp-of-fame British Invasion utility man ina career theat included stints with the Animals; Zoot Moneyís Big Roll Band; and Neil Sedaka. He rubbed shoulders with Clapton and Hendrix, toured relentlessly and practiced, practiced, practiced, finding himself at the end of it broke and giving guitar lessons to survive for an extended period in the 1970s. But then he met Sting and Copeland. The author analyzes incisively the unique sound of The Police, which benefitted greatly from his past forays into jazz and classical guitar, bringing an unprecedented degree of musicianship to the era’s requisite “punk” sound. The most arresting passages here describe the groupís mammoth world tours: He sharply observes the cultural strangeness of Japan (where he falls foul of the yakuza) and his experiences in Easyern Europe and the military dictatorships of Argentina and Chile ‚ simultaneously terrifying and surreally amusing, as are his adventures as John Belushi’s drug buddy. Summers is refreshingly endearing, with a self-deprecating wit, brisk pacing and elegant turns of phrase. There’s a familiar feeling I get when reaching the end of a book I’ve really enjoyed. It’s a bittersweet, slightly disorienting sensation of departing — against your will — a world that’s thoroughly captivated you, even if some part of you knew all along that your time there was destined to be limited. 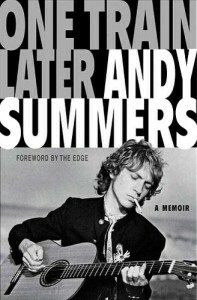 In this insightful musical autobiography, guitarist Andy Summers shares in intimate detail how he came to experience that same sensation, arriving — after great tribulation — at the peak of a legend-making career with the Police, only to face the inevitable yet all-too-soon breakup of the band that transformed him from a rock and roll footnote into a global superstar. One Train Later — so named out of karmic respect for the chance meeting on a train with Police drummer Stewart Copeland that would change the course of Summers’ life forever — is hardly an “insider’s expose,” though. Rather, it’s a knowing rumination on the joys and trials of a life devoted to making music, told with self-effacing and thoroughly endearing wit. Every person who picks up this book knows where it is headed — to the collision of Summers, Copeland and bassist/vocalist Sting and their 1979-1983 ascendance into the ranks of rock demigods — but the journey turns out to be at least as interesting as that glittering destination. From that pivotal moment, Summers tracks forward into his adolescent initiation into the secret brotherhood of chord-sharing among poor teenaged Brits who learn by ear off the radio and a handful of LPs; no lessons, no music books. His adventures as a young adult, after moving to London to try to make it in the music business, are the stuff of a serio-comic Dickens novel, full of great expectations and dashed hopes, daft bandmates and ridiculous gigs. As Summers’ skills and reputation grow and he links up with Zoot Money and the Big Roll Band, which evolves into Dantalion’s Chariot, which lands him a gig with Soft Machine, which leads to touring and recording with the 1968-69 lineup of Eric Burdon’s Animals. Through this period Summers relays anecdote upon wonderful anecdote — told with a rich mixture of classically British deadpan humor and entirely appropriate amazement – of life in the mid-60s London music scene. From scamming beers and gigs to jamming with Jimi Hendrix, Summers lives through a remarkably fertile musical era that sees him cross paths with the likes of Jimmy Page, James Brown and Eric Clapton, to whom Summers sells the Les Paul guitar that Clapton makes famous while playing in Cream. The path to the top is hardly a straight one, though. The vicissitudes of the rock life eventually land Summers in Los Angeles, jobless, in 1969. Almost five years, hundreds of guitar lessons taught and one ill-advised marriage later, he returns to London with a new bride for one more shot at making it as a professional musician. It takes another three-year slog through various groups of varying merit – highlighted financially by a stint as the hired-gun guitarist for (this is not a misprint) Neil Sedaka – before Summers runs into Copeland on the tube, and his life begins to change once again. This is the halfway point of the book. From there, things take off like a rocket. The acceleration of the narrative parallels the acceleration of the life being lived within it. Things spin faster and faster and faster until it becomes dizzying. Gigs, tours, recordings, singles, more gigs, press, fans, more recording, and the rocket leaves the launch pad and heads off into its well-chronicled orbit. It feels like a matter of weeks — though in fact it was three years – before Summers the struggling, near has-been guitarist with wife and child finds himself a single, rootless millionaire rock star, drowning his celebrity sorrows on a shroomed-out madman’s safari across the island of Bali with John Belushi. Three more years, many lines of cocaine and a great deal of in-studio tension later, the Police quietly call it quits at the very height of their popularity. The beauty of this book is that Summers, having been to the mountaintop and returned to tell the tale, appreciates in equal measures the glorious affirmation and the absolute insanity of life in the rock and roll circus. He renders in vivid detail the rapid disconnect from the everyday, the protective bubble in which one must exist or be rent limb from limb by one’s ravenous, hysterical “fans,” and the seductive, destructive nature of the machine which works 24/7 to feed both itself and the egos of the trio at the top. Managers are carted off to jail, marriages disintegrate, and wild times and assorted odd injuries ensue (note: it’s always handy to have an ENT on your small Caribbean island when you absent-mindedly stuff a candy wrapper all the way into your ear canal). For the curious, Summers is frank but generally kind when speaking of his former bandmates, and contrite about his failings as a husband and father. Sting does come off as aloof, controlling, and taken with his own celebrity, but that hardly qualifies as news. Summers still speaks of him (and Copeland, for that matter) with the affection of a long-time mate who stood shoulder to shoulder with him more times than toe to toe. Writing entirely in the present tense — a device which lends immediacy to every moment — Summers renders one scene after another with a rich mixture of clarity and bemusement, conveying both the intimate details and, with the benefit of twenty years’ perspective, the greater significance and/or absurdity of any given situation along his twisting path. One Train Later is a captivating ride through both a musical era and a life made in music, narrated by a gifted storyteller — a treat for any music lover, and essential for any Police fan. Q & A, followed by book signing.